That's me! 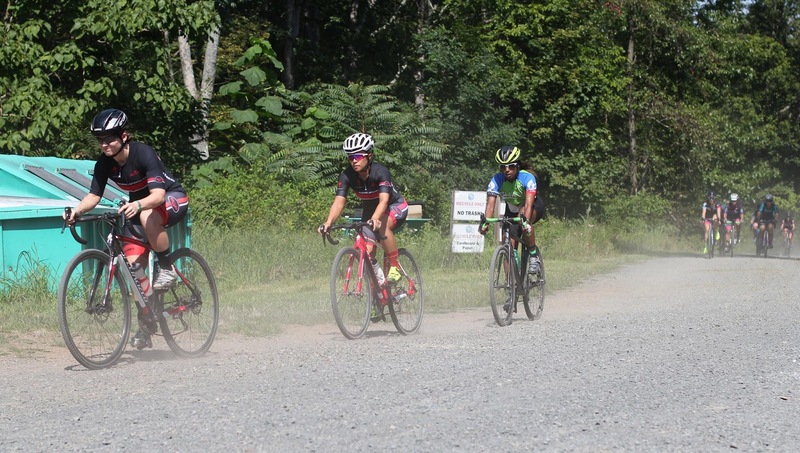 Face full of dirt, with my teammate Tina on my wheel. This was a new kind of race! It was a criterium, but on dirt. Road rules, cross vibe, and free beer after! I signed up for this race about a month ago. I also signed up for an online chemistry class, and the first lab meeting was on Saturday. It was supposed to run from 8 to noon, and my race was at 11. I'd given up on the hope of getting to go do the race, and was prepared to eat the $30 entry fee. But then, wonder of wonders, we got out of lab at 9:30! A glimmer of hope emerged. I raced home, threw everything in the car, and drove to Haymarket as quickly as possible. Checked in and got my number at 10:45, ready to roll with 9 minutes to spare! So I got no warm-up, and I didn't pre-ride the course. I rolled off the line with no earthly idea what was coming next. The women's fields raced combined. A few of the ladies took the pace out hot, and I managed to catch onto the back. I had a teammate ahead and a teammate behind. I hung in well enough, at the beginning, but wasn't taking the right lines through the gravel corners. In road racing, you get used to following the wheels in front of you, if you know them, but not all of the wheels were reliable on the loose stuff. There were a few times where I missed a corner and had to push hard to catch back on to the lead group. 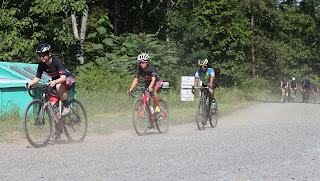 With about 5 laps to go (out of 9 or 10, I don't remember), I went wide in a corner and fell off the lead pack. Drilled it to bridge back on (with two other riders on my wheel), realized I could pull the pin and finish the race or keep going and blow up in the heat, and pulled off. The girl behind me didn't appreciate losing her free ride. She said something as she came around me, and it didn't sound nice. But I was more interested in finishing the race without throwing up. So I let the lead pack go and treated the rest of the race as an interval workout. Ended up lapping a few stragglers and passing a few for higher placing (including the wheel-sucker with the witty remarks). Ended up 5th in a field of 19, and that was stone cold at the start without a pre-ride! Great race. Well run. A terrific warm up for the cross season. I hope they do it again next year! I'd definitely do it again!